We understand where [John Clarke Mills] is coming from when he says he wants a home theater but not at the expense of dedicating a room to it. His situation is a bit more sticky than most folks in that he has a beautifully kept Victorian era home. Recently he was removing a renovation from ages past that didn’t fit with the style and it gave him the opportunity to build in this hidden projector screen. Years ago someone walled in this opening and added french doors. After opening up the wall [John] sized up the situation and decided he had just enough room to build a soffit which could hide a rolled up projection surface. 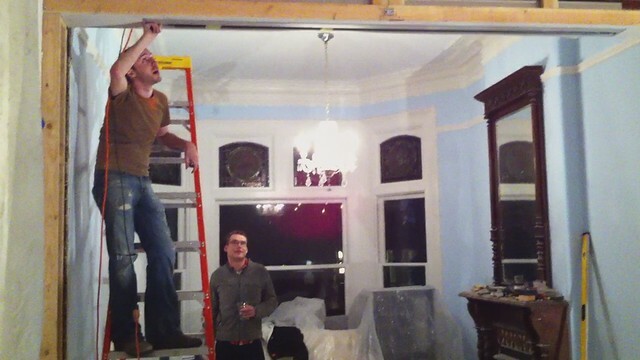 He purchased a motorized screen (we’ve seen a few diy projection screens but can’t remember one that rolls up) and built a slot into the design just large enough for the screen to pass through. He’s testing it out in the clip after the break before doing the plaster work. The columns on either side are his additions as well. The floor of the house is unlevel and one of those columns ended up a full inch longer than the other. We certainly can’t tell. Very clever use of space! What if you want to watch a movie during the day? Anyway very nice, fits in with the house perfectly, now all you need is a bowl of popcorn and a DVD of Modern Times. Very nice but I prefer to have a room with one windows that can be covered by projection screen. Yes, that’s what I intend to do. Nice install, although there are screens designed for this exact kind of install readily available on the market and cost little most than a regular screen considering the work going into this. Speakers can be hidden in the pedestal bases of the columns. That’s where I would put them. But how did he mount the projector? Is it also well hidden? Yes, I want an answer to this as well. Nice idea, but the columns are utterly bizarre in the context of authentic Victoriana! it’s not the focal point of the entire home, the entire point of this article is that he constructed it in a manner that it goes away entirely when it’s not in use. Mike Szczys liked Project 72 - Korg DW-6000 wave memory expansion. Arsenijs liked SPINEO Adapter Board. John has added details to SPINEO Adapter Board. James Hall liked Arcus-3D-P1 - Pick and Place for 3D printers. John has added a new project titled SPINEO Adapter Board. deshipu wrote a reply on Skull. M. Bindhammer has updated details to iF°EVE.